This ethereal blend inspires the wearer to follow their dreams with trust and relaxation. The oils work with the crown and sacral chakras to enhance positive visualization and confidence. Ho Wood – Promotes rest, relaxation, and confidence. Sandalwood – Increases spiritual energy and faith. Works with the sacral and crown chakra. Roll onto pulse points as often as desired for a beautiful perfume aroma. Inhale and concentrate on desired state of mind. 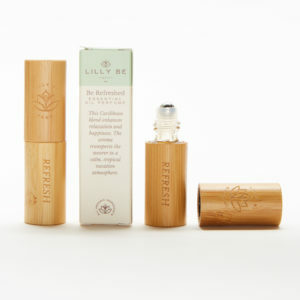 Our glass rollers encased in natural bamboo are also refillable by lifting the roller ball and filling with your own favorite blend of essential oils. Enjoy your keepsake bottles for years to come.